I don't consider our family super healthy eaters...normal healthy, yes. We don't buy organic on a regular basis. We cook a lot, but aren't on any sort of diet. Sure we don't have salt in the house, which many seem to find strange, but pepper and other spices flow in abundance. Lately I have been discovering, we do eat healthy compared to most people. When Connor was a baby, I made his food. I didn't make it because I wanted to control exactly what went into it. Rather I made it because I discovered I could make about ten times as much for the same price as one or two jars of baby food. I just couldn't stomach how expensive baby food was. So, I made my own. Simple as that. I really didn't follow recipes (I am not a huge fan, I consider them inspiration). Rather, I put in ingredients I thought would be good and tasted it myself to see if I liked it. Then I fed it to him. Having lived in Scotland for a while, I got used to cooking. Fast food isn't as easily and cheaply available there as it is in the US. Since moving home, we have pretty much stuck with that trend. Unless we are traveling, we rarely go pick up fast food. Except for the occasional In-n-Out run...but seriously, who can resist In-n-Out? And I have gotten used to cooking, so we do make most of our meals, though I am not going to lie and act like we never go out to eat. 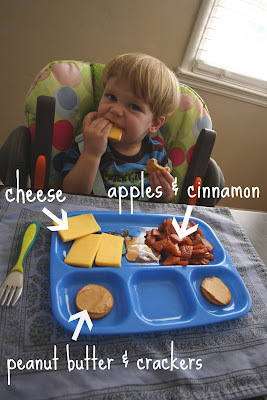 Lately I have been intrigued by how many moms feed their toddlers and children crap. They pick up fast food all the time and/or feed them some frozen variety of fish sticks, chicken nuggets, mac & cheese, etc. And it got me thinking about what I feed Connor and how much effort I put into feeding him. Really not that much. We are a family that loves fruit, so we always have a variety in the house - apples, bananas, grapes, peaches, nectarines, clementines...you get the picture. And fruit makes for an easy snack. We also live in the central valley, so all types of produce are readily available to us. I forget how blessed we are with all the fresh produce. Its much cheaper to shop at farmers markets and fruit stands for produce than the grocery store. Not to mention fresher. Now most of the time I don't whip Connor up an entire meal for himself during the day. Well...for breakfast I do usually make him an egg though. But for lunch, he usually gets a sample platter of sorts. Basically a plate filled with different, healthy things I know he will eat. For dinner, he now eats what we eat, with some supplements depending on what we are having. See? Not that hard. Or expensive for that matter. So my question remains, why do so many people eat and feed their children crap when with minimal effort they could actually be setting them up for a lifetime of eating success by teaching them to like the good stuff and limit the crap? I admit that Aubrey gets mac n cheese probably twice a week. She likes it, she eats it without a fuss, but she will have fruit or string cheese with it. She eats McD but not too often. She was 2 before she had McD. I don't understand moms that feed there kids all kinds of garbage. Good for you for making healthy choices for your family! !